Property 2: Self contained cottage next to swimming pool. 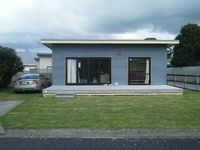 Property 3: Stylish apartment between Waihi Beach and Katikati. Harbour, Pacific and Kamai Range views, all in one.! Property 4: Harbour, Pacific and Kamai Range views, all in one.! Property 12: Stunning, Private, Secure, and Modern Cottage. Property 13: SNAZZY! Right in the middle of the action! Property 17: Family friendly and a short stroll to the beach - you can hear the surf. Property 21: Comfy home opp Gilmour Lake. Property 24: Private, quiet, cottage adjoining stream. Property 28: Gorgeous cottage beside stoney bottom stream! 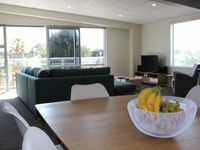 Property 37: Brilliantly positioned 35 metres from the beach. Property 47: This is a real kick back bach - come and relax! Property 50: Relaxing central retreat 500m to beach. Thanks amazing apartment in a beautiful location. Owners fantastic to deal with. Thanks Val, we had a lovely relaxing Easter, the house was great and very comfy for our family holiday, Kathryn.